Back cover blurb: In 1987, Miri Ammerman returns to her hometown of Elizabeth, New Jersey, to attend a commemoration of the worst year of her life. Thirty-five years earlier, when Miri was fifteen and in love for the first time, three planes fell from the sky within three months, leaving a community reeling. 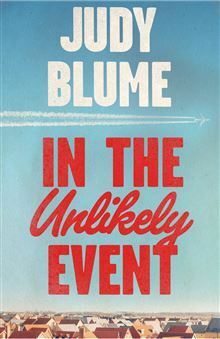 Against this backdrop of actual events in the early 1950s, when airline travel was new and exciting and everyone dreamed of going somewhere, Judy Blume weaves a haunting story of three generations of families, friends, and strangers, whose lives are for ever changed in the aftermath. The plane crashes bring some people closer together and tear others apart; they create myths and unlock secrets. As Miri experiences the ordinary joys and pains of growing up in extraordinary circumstances, a young journalist makes his name reporting tragedy. And through it all, one generation reminds another that life goes on. I cannot begin to tell you how excited I was when I heard that Judy Blume was writing a new adult novel. Not only was Judy one of my favourite authors growing up, but it was a novel featuring plane crashes (yes, I know I'm strange, but we've been here before)!! In the unlikely event is set in 1950s Elizabeth, New Jersey. A place that become known as the 'Plane Crash City' when three planes crashed en route to or from Newark airport between December 1951 and February 1952. The tragic demise of these flights; Miami Airlines (Non scheduled), American Airlines 6780, National Airlines 101 was eventually ruled to be unrelated, but it shook a community to its core. In the unlikely event is told from a number of different perspectives (quite a large number actually), but you really get to know each one of them individually. Judy's strength as a writer has always been to get inside a teenage girl's head and let out all of their anxiety on to us the reader - who usually at the time was a teenage girl with those exact same anxieties herself. Perhaps it is because of this ability that Miri (Miriam, 'Mirabelle') was my absolute favourite character in this novel. Miri is Fifteen at the time of the first crash, she has (literally) just gotten herself a boyfriend and is feeling pretty pleased with life. Having gained a boyfriend, Miri loses one of her best friends to the crash; not physically for Natalie is still alive, but emotionally things will never be the same between them. The same goes for many of Elizabeth's residents. Witnessing a plane crash can be life changing. When the second plane crashes, the calls for Newark airport to be shut grow increasingly louder. It takes the third plane to crash before the calls are heard and taken seriously. At Miri's school conspiracy theories are rife, and Miri shares these in the school newspaper, only to be threatened with exclusion. As the community begin to rebuild their lives, some are unable to stay in Elizabeth and begin to move away from the city, the consequences of the crashes more far reaching than anyone could have envisaged. In the unlikely event is a wonderful novel, very honest, beautifully written; and not just for Judy Blume fans! In the unlikely event is available to buy now from Amazon online and all good book shops.